Precision Gage Blocks are widely available in sets in various sizes. The nominal gage lengths of blocks are mathematically determined so that specific desired lengths can be obtained by combining selected blocks. Several tolerance grades are available per ASME B89.1.9‐2002 ( USA ). They are made to several different tolerance grades categorized as Master Blocks, Calibration Blocks, Inspection Blocks, and Workshop Blocks. Inspection blocks are used as standards and for comparative gauging. Workshop blocks are uses as gauges on the shop floor for a variety of direct measurement precision application. 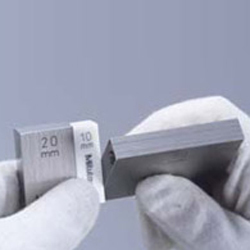 Thread Check Inc offers an extensive selection of Mitutoyo gage blocks in various grades in a choice of rectangular or square, metric or inch, and steel or CERA ( ceramic ) types. Contact a Thread Check sales engineer for assistance with your requirements. Wringing is the method of placing two gage blocks together. Wringing is accomplished by placing one block crosswise from another and then swiveling it parallel with pressure which causes the two blocks to adhere to each other creating a new length from the combined two sizes. Multiple gage blocks can be combined using this wringing process. It is best to use the least amount of gage blocks to achieve a desired length. AS-1 gage blocks are intended for shop floor use to set and calibrate precision instruments, gages and fixtures. Steel gage blocks are made of high carbon high chrome steel to sufficiently satisfy a variety of material characteristics required for gage blocks. A certificate of inspection is furnished with all Mitutoyo gage blocks with a serial number on the case and an identification number on each block. The deviation of each block is registered. For this inspection each gage block is measured relative to the upper level master using a gage block comparator.